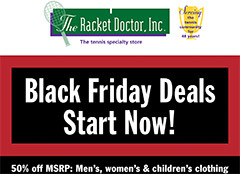 Online and print advertising for The Racket Doctor, Los Angeles’ largest tennis retail store. 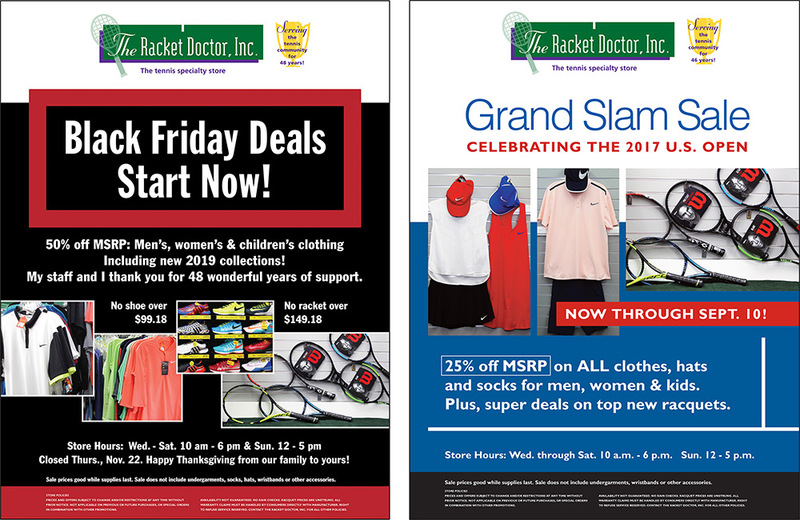 Window posters, Instagram ads and e-blasts promote special sales throughout the year. 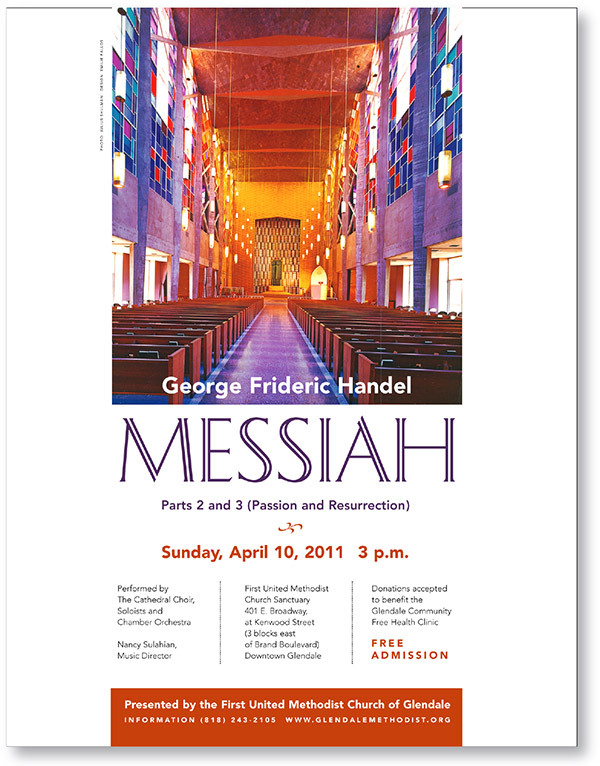 Design of print and digital event materials and outdoor banners for a performance of Handel’s Messiah. Lenten color scheme (purple), classic typography and vintage photo are visually compelling. Photography: Julius Shulman (from the church’s archives). 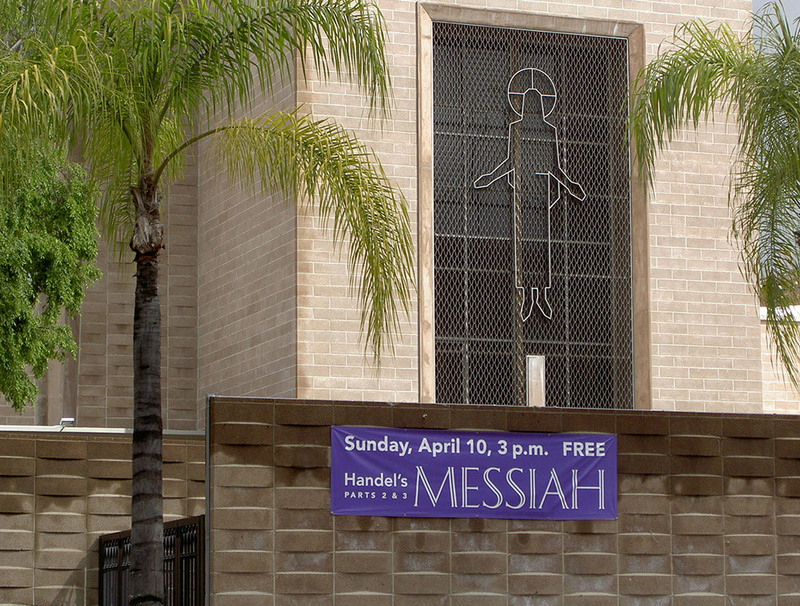 Our beautifully printed art & architectural symbolism brochure features a walking tour of First United Methodist Church of Glendale’s sanctuary. If you haven’t seen this majestic building in person, visit on Sunday morning for worship in the magnificent sanctuary and hear the finest pipe organ in the city. 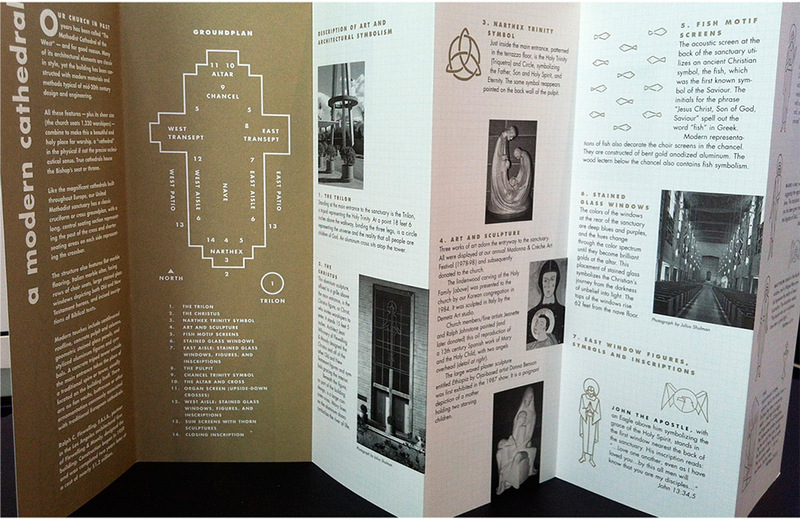 Then take a look at the impressive architectural symbolism in the nave and in the courtyard. The AIA-award-winning building was completed in 1961 by architects Flewelling & Moody of Pasadena, CA. We were privileged to meet with Mr. Jean Whinnery, the architect who created all of the sanctuary’s symbolism, while researching, designing and writing this project. 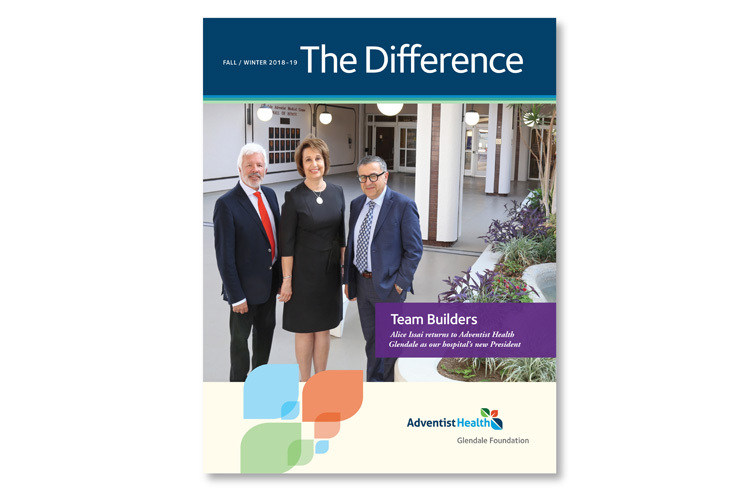 Our firm designs the donor magazine for the Adventist Health Glendale Foundation. 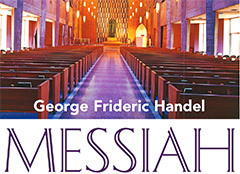 Cover is shown above. Classic design adds value to stories and photos. 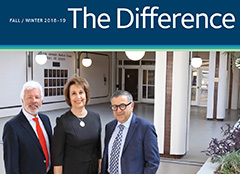 View Fall 2018 issue HERE (PDF format). This publication uses Adobe Reader. To download free software, click here. 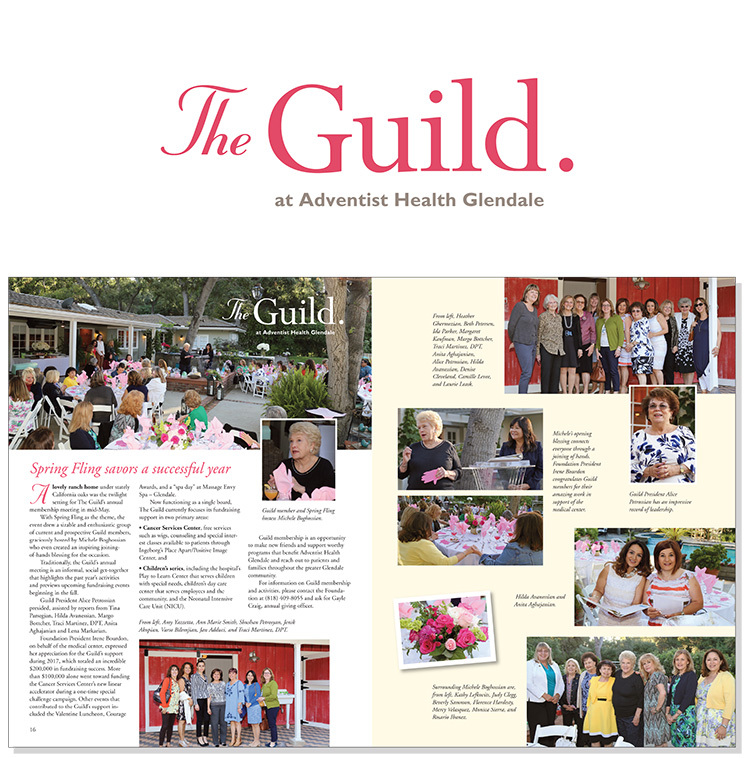 Our studio designed the visual identity for The Guild, the philanthropic group of (mostly women) donors associated with the hospital. 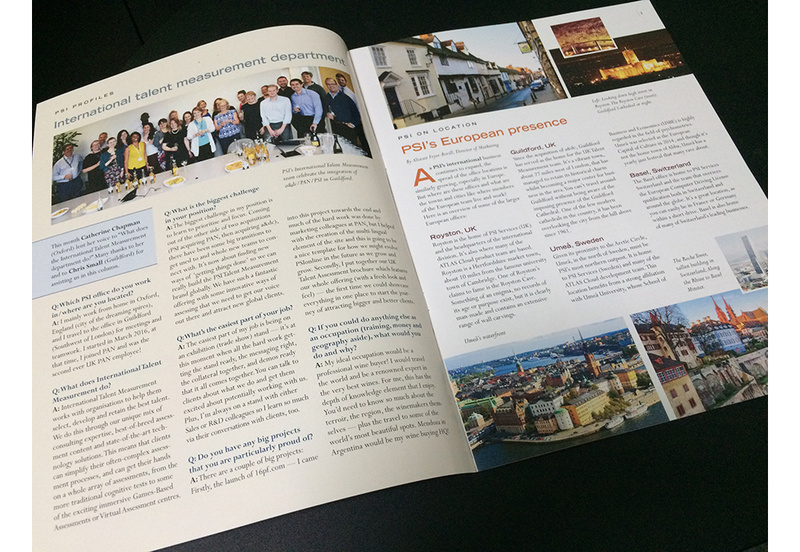 The Foundation publishes a printed quarterly magazine which our firm also designs. 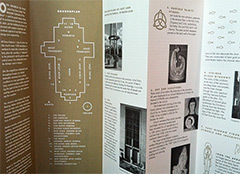 Two-page spread of a recent issue is shown above. 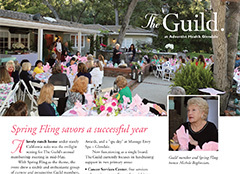 “September Serenade” is an autumn concert and soiree held in the elegant Pasadena home of a Foundation Board member. 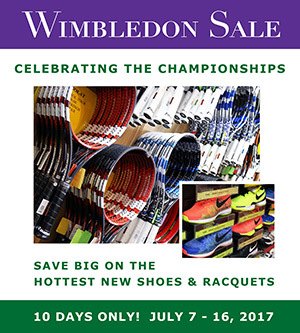 The event raises funds for the hospital’s Cancer Center. 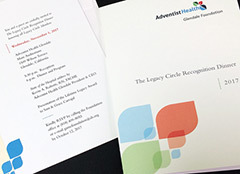 The Legacy Circle is the premiere philanthropic group at Adventist Health Glendale. 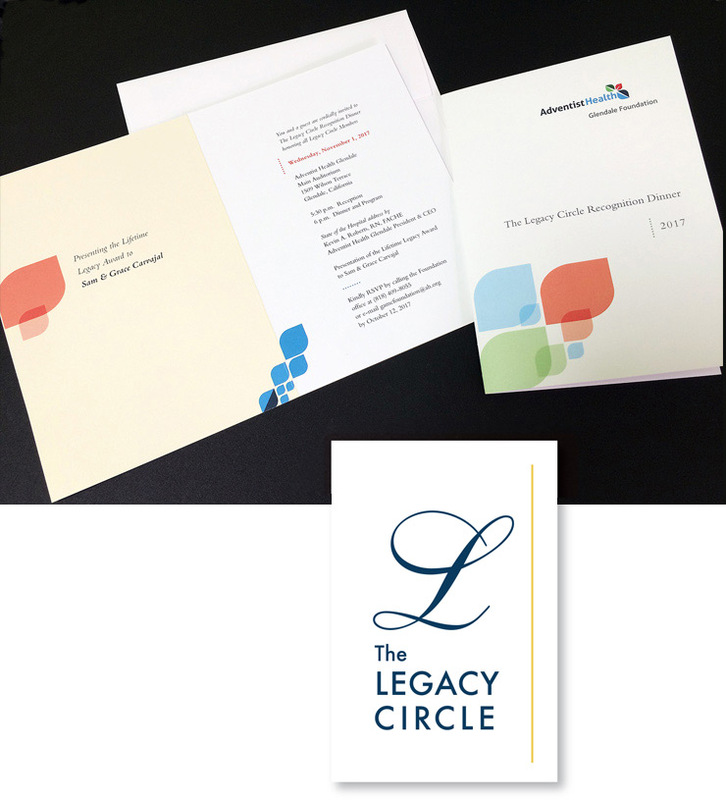 We created the visual look for various applications, from lapel pins and print to environmental graphics. The identity pays tribute to hospital’s 100th anniversary (the classic script “L”), with a fresh color scheme for today: indigo blue and sunflower yellow. Typefaces are Shelley Allegro and Futura. 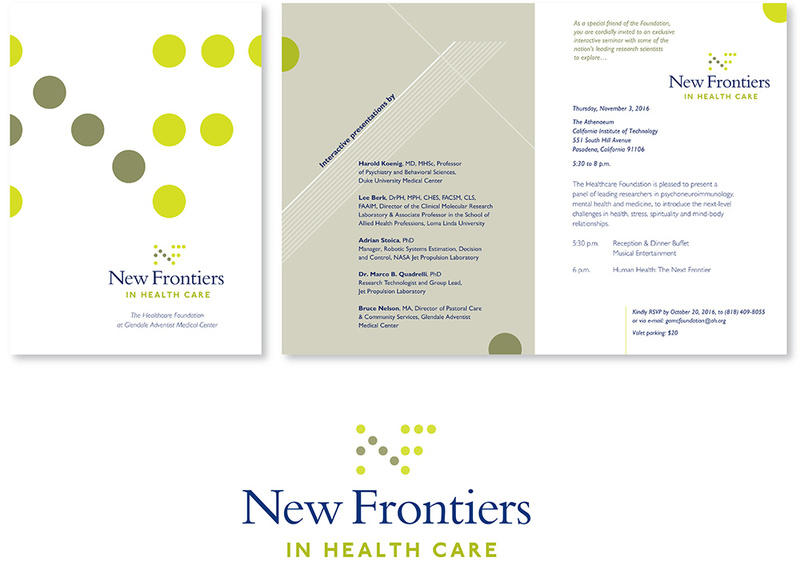 Design of special event identity and print materials for scientific symposium. 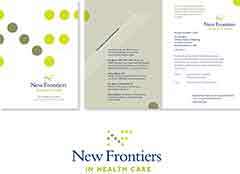 “NF” monogram, with its dot configuration, is inspired by cells, the basic building blocks of life. Invitation: Cover art and inside spread shown here. 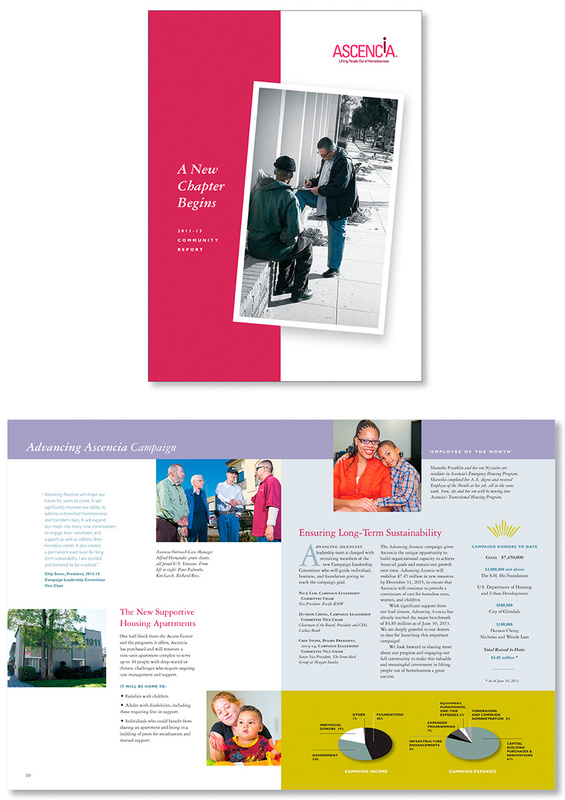 We designed this report for Ascencia, the largest homeless services agency in the Glendale-Pasadena-Burbank area. Our creative team visited Ascencia several times, talking with staff and volunteers, and photographing and interviewing current and past residents. We were inspired by the many stories. 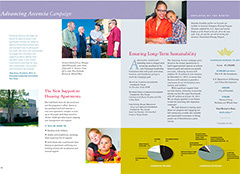 The report has been a successful part of Ascencia’s Capital Campaign. Updated visual look for a real estate investment and property management company founded in the 1960s. 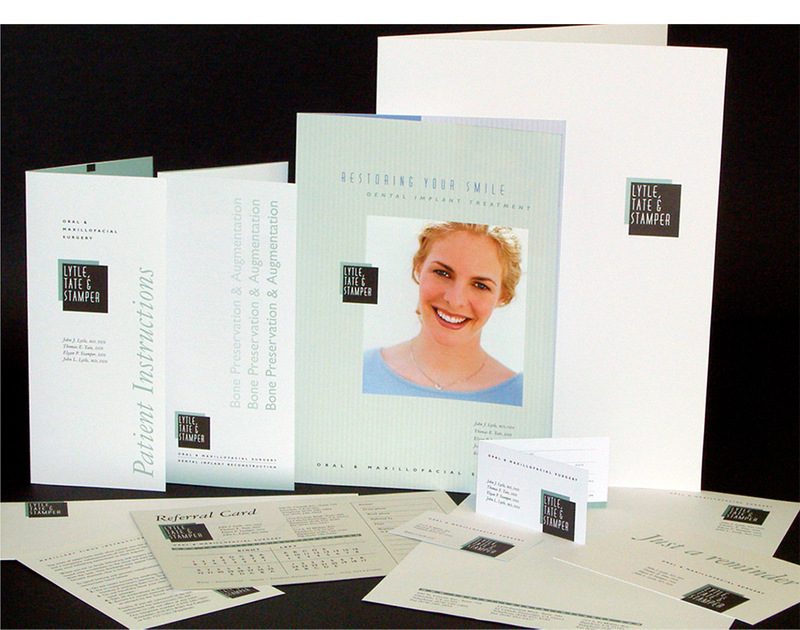 Projects include print, digital and signs. 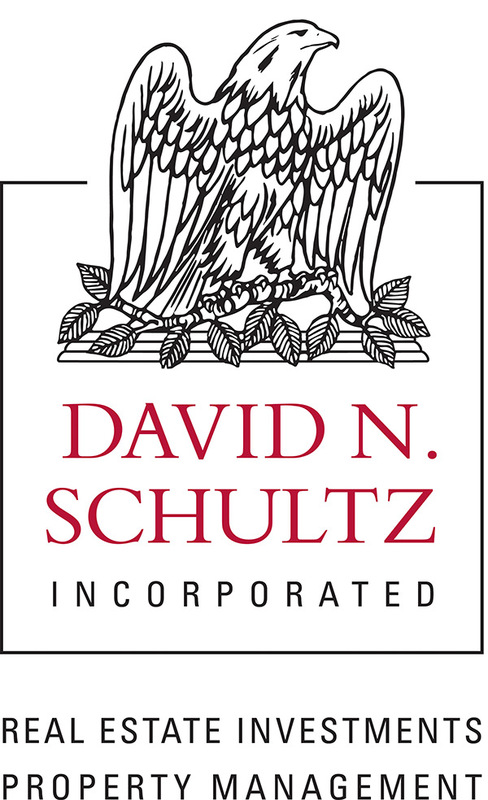 We retained the original 1960s eagle illustration, paired with new type and color scheme. 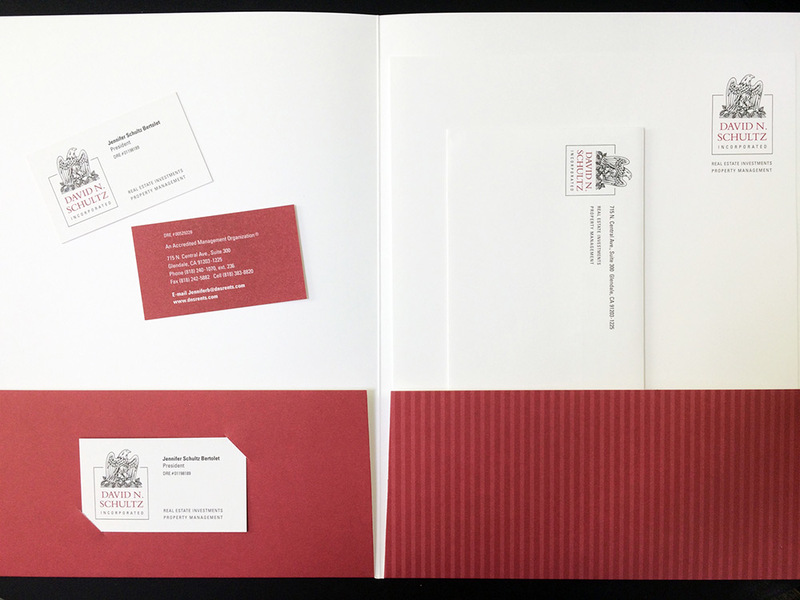 Identity, presentation folder and stationery shown above. 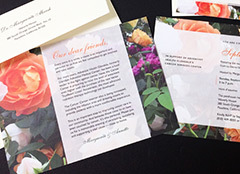 Copywriting and design of sales literature highlighting Swaner’s capabilities and manufacturing process. 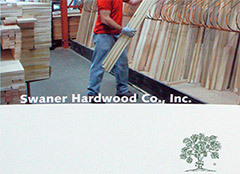 Point-of-purchase cards show wood products’ finished look. 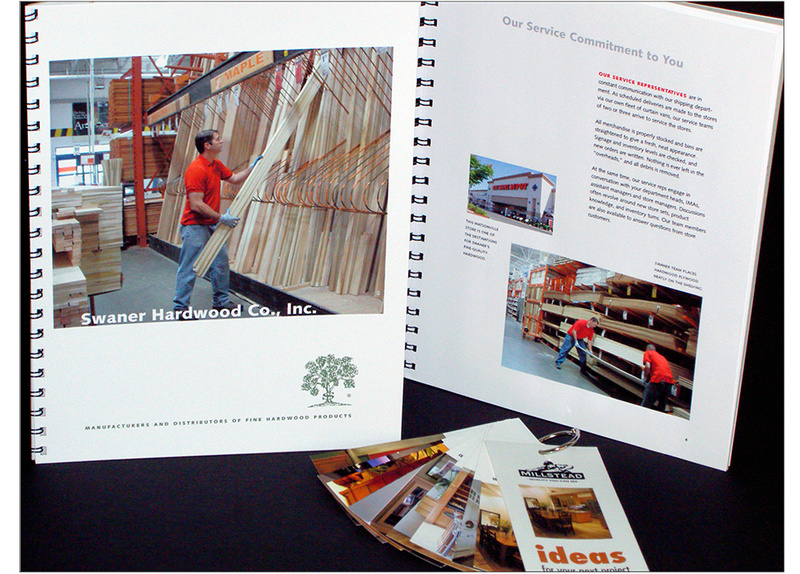 Swaner Hardwood Co. earned a multi-million dollar contract with The Home Depot by presenting this custom capabilities book our creative team wrote and designed. 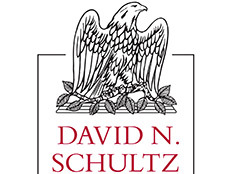 The book’s cover created immediate “buzz.” “Pick me up and read me!” It set the stage for a presentation of exceptional product and service which put Swaner Hardwood above the competitition. CEO Gary Swaner’s smart investment in professional design helped secure his company’s long-term contract with The Home Depot. 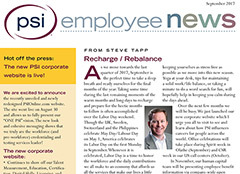 We design PSI Employee News, a monthly digital and print publication for PSI staff. The company is a global licensure and certification firm headquartered in Los Angeles, with offices across the US, Europe and Asia. 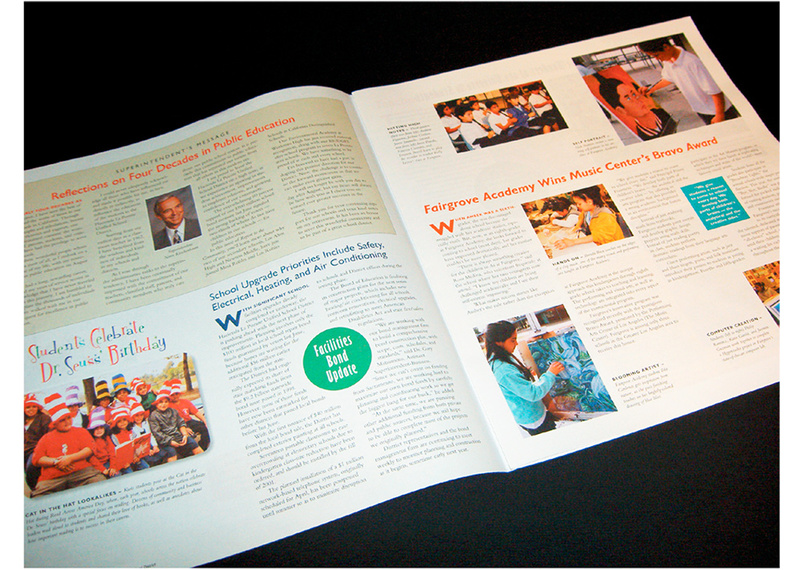 Issues contain feature stories, articles and special event photos. 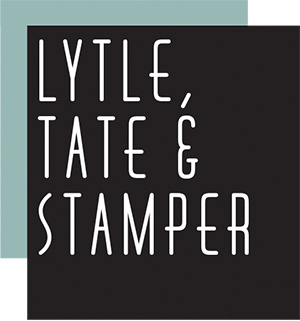 Lytle, Tate & Stamper is a premiere oral surgery practice in the L.A. area. 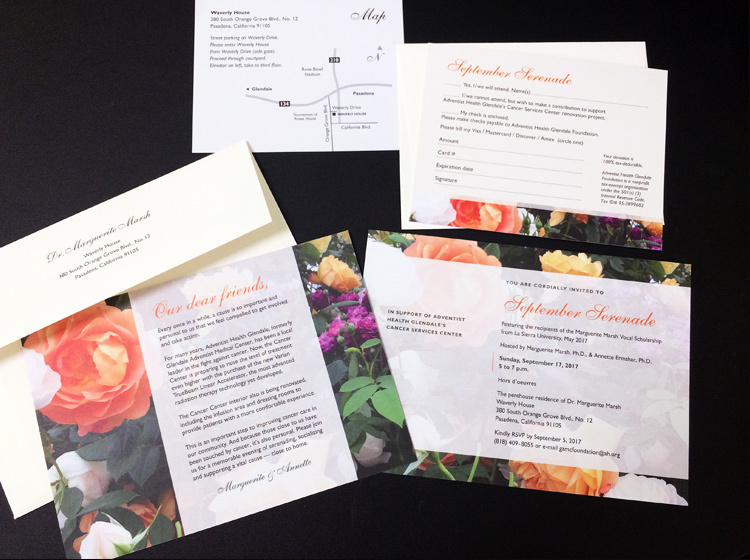 This creative project features many elements — business & appointment cards, notecards, letterhead, envelopes in various sizes, referral cards, custom presentation folder and brochures. The identity was inspired by the luxe celadon and black ceramic tiles in the Pantages Theatre, a classic Hollywood Art Deco landmark. 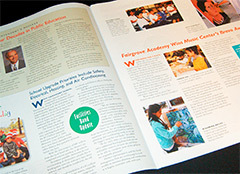 Quarterly print publication design for school district features eye-catching photos and a wealth of information for parents and the community. Larger 12 x 12 in. format is colorful and engaging. 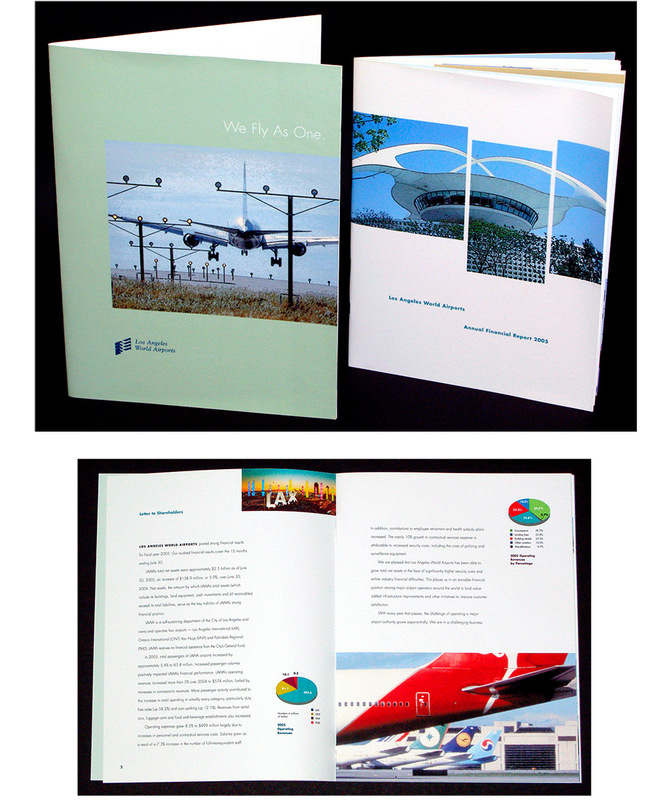 These printed materials are two projects we created for LAX. A 9 x 12 in. 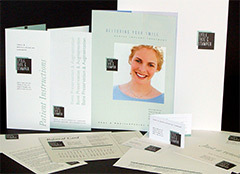 presentation folder holds the annual report to shareholders. 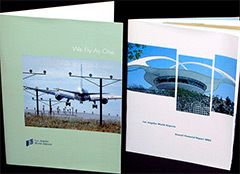 Both pieces feature artwork from the airport’s archives.